As our working environment becomes ever more litigious, the need for Estate agents to carry professional indemnity (PI) insurance is increasingly apparent. If you are an Estate Agent, Letting Agent or Property Manager seeking cost effective PI insurance from someone who understands your business, we can help you. If you are a member of NAEA, ARLA, ICAB, NAVA or APIP then your company will need one of three levels of cover depending upon your business activities and fee income. Please ensure your cover meets the appropriate level. 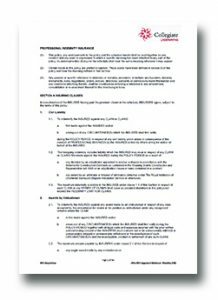 The minimum limit of indemnity is £100,000. However, if a company operates as an agency in residential lettings, and the total fee income for the company from all sources is £150,000 or less, then the limit of indemnity must be a minimum of £150,000. If a company operates as an agency in residential lettings, and the total fee income for the company from all sources is over £150,000, then the minimum limit of indemnity must be £500,000. We also have a fully compliant Royal Institute of Chartered Surveyors (RICS) policy for those firms regulated by RICS, for more information please visit the ‘surveyors’ section of this website. If you are a member of an Ombudsman scheme then you are required to maintain PI insurance. Previously under the Estate Agents Act 1979 anyone could set up in business as an Estate Agent unless they had been banned by the Office of Fair Trading or were bankrupt. More recently the Consumers, Estate Agents and Redress (CEAR) Act 2007 requires those engaging in estate agency work (in relation to residential property) to be members of an OFT approved estate agents redress scheme. 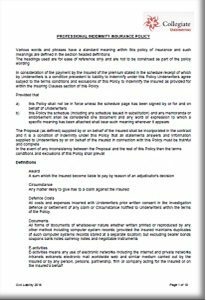 A requirement of these schemes is that a professional indemnity insurance policy is held. All Professional Indemnity Insurance is on a claims made basis, that means you must have an active PI policy at the time a claim or allegation is made against you. It is important to remember that once a PI policy expires you can no longer make any claims against it. Therefore you need to consider maintaining your PI insurance once you cease trading. This is called Runoff Insurance and provides protection against any claims which may arise from work you undertook in the past. The RICS require all of their members to carry Runoff insurance for a minimum of six years once they cease trading, and that they consider maintaining it after this period.